The Society works alongside the Parish Council to ensure that the footpath network is checked at least three times a year to make certain that use is not denied. They also organise regular walks. Tamar Valley Centre, Drakewalls. Open Tues/Wed 12-5; Thurs/Fri 9-2 p.m.
Every week on a Thursday morning in the Village Hall from 10 a.m. to 11.30 for coffee, tea, cakes and chat. Wed 2.30 p.m – St Anne’s Church Hall. All abilities welcome. 4th Saturday each month – 10:30-12 noon in St Anne’s Church Hall. Bring along your own handiwork or join in the current project. Hawkmoor site PL18 9LH, one of the most attractive pitches in the Duchy on the banks of the River Tamar. The aim of the 150 artists is to bring this area of natural beauty to life through art. An informal monthly meeting sharing gardening knowledge and occasional visits to nurseries, open gardens. Interested? Want a go? Do you sing, dance, play an instrument, sew, paint, sign write, build things, play with technical equipment, or even want to perform??? If so contact us or join us at any of the GLAD socials. Chair: Lesley Smith 07768 527544. 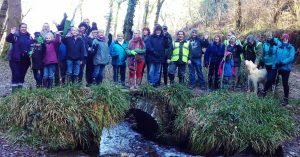 GCM began two years ago in 2016 with the aim of enhancing the village environment and improving the quality of life in partnership with all sections of the community and interest groups. Progress can be seen in all sorts of ways physically – planters, regular plant stall, car park and phone box repainted, new notice boards, litter picks, mural, children’s living play project and, of course, the Christmas lights. Socially, we’ve enjoyed local walks, discos, street party, quizzes and creative cafe. Lots of ideas for the future too. And the GCM Facebook page has been very popular and used daily in many positive ways. Chair: Ross Hanley 01822 834773. Held annually in July. This year 8-15 July 2018. Play in the Duchy League. Home pitch now The Butts Playing Field PL18 9DS (near Cyril Worth Removals between Albaston and Calstock). Meet fortnightly Wed 10 a.m.
Every Thursday, start 7 p.m. All abilities welcome. Normally share lifts from Gunnislake Car Park to either Dupath Barn, with Callington Samba Band or Union Corner with Plymouth Community Samba Band. Every Tuesday evening in the Village Hall 6-9 p.m. 6.15-7.15 younger people; 7.15-9 adults. Meet last Saturday in month at Tamar Valley Methodist Church, Albaston 7.30 p.m. for interesting talks and during the summer some visits. First Wednesday every month 7.30 p.m. onwards at The Rising Sun, Lower Calstock Rd. Bring your own sewing, knitting, cross stitch or whatever creative project you’re doing. Or just join in the natter. 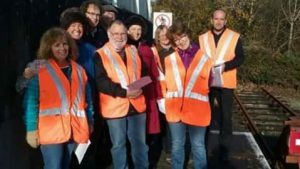 Volunteer drivers run regular trips and special outings for all ages, for example: Callington Library, Trago Mills, Truro, Dartmouth, Pub Lunch. See full timetable under TRANSPORT. Tuesdays 6.15 – 8.30 p.m. in Harrowbarrow & Metherell Village Hall. Right in the centre of the village in Fore Street. Held on the second Saturday of the month in and around the Buccanneer pub from 9 a.m. to 12 noon.